You are at:Home»La Scena Online»Newswire»Our 2017-2018 Arts Resource Guide Is Here ! Our 2017-2018 Arts Resource Guide Is Here ! La Scena Musicale is pleased to announce that its annual Arts Resource Guide is finally here for the ninth year in a row. The resource guide, which is the only one of its kind in Quebec, is an excellent source of information for the province’s music lovers, and for arts students and their parents. This year, the guide will continue its user friendly digest format. 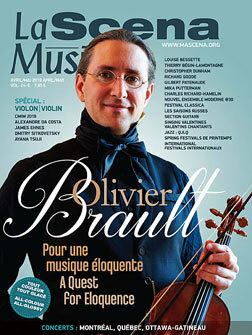 A total of 25,000 copies will be distributed Quebec-wide. Readers will find essential information on music, dance, theatre, film and the visual arts in this bilingual directory, which will include both regional and national listings. Special Sections: Our annual Choir Guide helps amateur and professional singers find a choir. Our annual Venue Guide helps musicians and artists choose performing and exhibition rental venues. The resource guide is an essential tool for teachers and performers in music and in the arts that remains an invaluable tool all year long. ⇒Take a look at our PDF version! Take a look at our PDF version !